Located in the 6th district one of the most elegant part of the left bank, this hotel is only one block away from the Montparnasse district with plenty of restaurants, cafes, cinemas and brasseries. Each of the 50 bedrooms, tastefully decorated and newly refurbished is equipped with en suite bathroom, satellite color television, radio-alarm clock and direct-dial telephone and of course, air-conditioned. A la villa des Artistes, is a little artists' haven in Montparnasse for those who wants to stay in a different hotel. 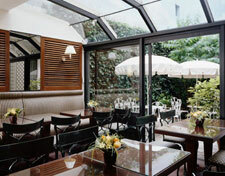 Even the very appealing name " villa" calls for an intimate atmosphere. La Villa des Artistes has 55 smoke free rooms spread over 5 floors with full air conditioning, en suite bathroom, satellite TV, direct dial phone, Pay TV, FREE WIFI access, minibar, tea and coffee facilities (on request), radio, individual safe and hair dryer.